Philippine President Rodrigo Duterte arrives at an event with Filipino community in Hong Kong, April 12, 2018. The Philippine president’s mild stance toward Chinese expansion in a disputed sea, while worrying people at home, has stopped China from pushing further into Manila’s claims, analysts say. When Philippine President Rodrigo Duterte began repairing relations with China in late 2016, maritime scholars and some common Filipinos feared that Beijing would expand freely in Philippine-claimed waters in return for giving the country economic help. China has the world’s second largest economy and third strongest military. It claims 90 percent of the sea, more than other countries that call parts of it their own. Philippine Foreign Affairs Secretary Alan Peter Cayetano said Friday that the government was trying to grasp whether China installed anti-ship cruise missiles and surface-to-air missiles on three of the sea’s Spratly Island features under effective Chinese control, domestic media reported. This flap will probably fade away, scholars say. Beijing has pulled back from several expansion efforts during Duterte's term, they add. “China is actually careful about it while Duterte is the president, while relations are actually good between the Philippines and China,” said Herman Kraft, a political science professor at the University of the Philippines Diliman in Metro Manila. After hearing reports of Chinese activities in parts of the South China Sea claimed by Manila, academics, lawmakers and at times a senior Supreme Court associate justice sometimes ask Duterte to intervene. The Philippine government will “resort to diplomatic protests” against reports of the Chinese missile buildup if foreign affairs officials “deem it fit,” presidential office spokesman Harry Roque said Saturday via the office website. The missile reports, he said, had not been verified. “And of course, we capitalize on the fact that we have very good relationship with China,” Roque said. Domestic media quoted the presidential office saying Duterte was “confident” the missiles would not be aimed at the Philippines. Duterte’s 18-month-old effort to mend relations with China met with Beijing’s pledge of $24 billion in aid and investment for the Philippines as the impoverished but fast-growing country pursues a 5-year infrastructure renewal program. Duterte’s predecessor sparred with Beijing for four years over Chinese occupation of the South China Sea. Brunei, Malaysia, Taiwan and Vietnam also overlap China’s claims in the 3.5 million-square-kilometer sea that’s valued for fisheries, oil and gas. 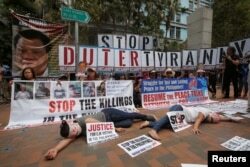 Protesters against Philippine President Rodrigo Duterte demonstrate near the hotel where he is staying at during his visit to Hong Kong, April 12, 2018. China has rewarded Duterte’s conciliatory approach by retreating from waters near the Philippines on at least three occasions, experts say. Last year the Chinese coast guard gave Filipino fishing boats access to Scarborough Shoal, a 150-square-kilometer islet claimed by both as a prized fishery. China has pursued “no further buildup” at the shoal either despite its strategic importance, Koh said. Its occupation of the shoal sparked the fall in Sino-Philippine relations from 2012 to 2016. China quit prospecting earlier this year at Philippine Rise, over an undersea plateau on the Philippine Pacific Ocean continental shelf, after Duterte stopped cooperation. Filipinos had angered about Chinese research vessels near the rise a year earlier. Last year after Filipino fishermen landed on sandbar between Chinese-controlled Subi Reef and Philippine-held Thitu Island in the Spratly chain, China sent naval and coast guard vessels in response, said Gregory Poling, director of the Asia Maritime Transparency Initiative of the American think tank Center for Strategic and International Studies. When countries challenge China, Beijing sometimes responds in kind. After the United States sent an aircraft carrier to the South China Sea in March, China held military drills in the same waterway. The United States does not have a claim to the sea but wants it to stay open internationally. China’s deployment of missiles in the Spratly archipelago without Philippine consent violates its pledge in August to avoid "expansion" in the Southeast Asian country’s maritime exclusive economic zone, said Antonio Contreras, political scientist at De La Salle University in the Philippines. “We’re just hoping that there’s some back channeling here or the president would prefer to be non-confrontational and he will be more into soft discussions with the diplomatic channels and try to convince China to withdraw, but I don’t know whether that works for China,” Contreras said. Any restraint shown by China now could end when Duterte leaves office in 2022 due to term limits, some experts warn. If a China “hawk” wins that election, China could act more aggressively, Kraft said.